Click the button below to install on Chrome. Visit the extended installation page for instructions on installing in Firefox, Safari, Edge, or Opera. The Facebook interface is filled with numbers. These numbers, or metrics, measure and present our social value and activity, enumerating friends, likes, comments, and more. Facebook Demetricator is a web browser addon that hides these metrics. No longer is the focus on how many friends you have or on how much they like your status, but on who they are and what they said. Friend counts disappear. ’16 people like this’ becomes ‘people like this’. Through changes like these, Demetricator invites Facebook’s users to try the system without the numbers, to see how their experience is changed by their absence. With this work I aim to disrupt the prescribed sociality these metrics produce, enabling a network society that isn’t dependent on quantification. As a regular user of Facebook I continually find myself being enticed by its endless use of numbers. How many likes did my photos get today? What’s my friend count? How much did people like my status? I focus on these quantifications, watching for the counts of responses rather than the responses themselves, or waiting for numbers of friend requests to appear rather than looking for meaningful connections. In other words, these numbers lead me to evaluate my participation within the system from a metricated viewpoint. What’s going on here is that these quantifications of social connection play right into our (capitalism-inspired) innate desire for more. This isn’t surprising as we’re living in a time when our collective obsession with metrics plays out as an insatiable desire to make every number go higher. How much money did I earn? How many choices do I have? Perhaps the most destructive example of this is the financial crisis of the late aughts, when a constant desire for more led the global economy into financial ruin. Bringing this back to Facebook, I find myself asking questions about how it affects user behavior. Would we add as many friends if we weren’t constantly presented with a running total and told that adding another is “+1”? 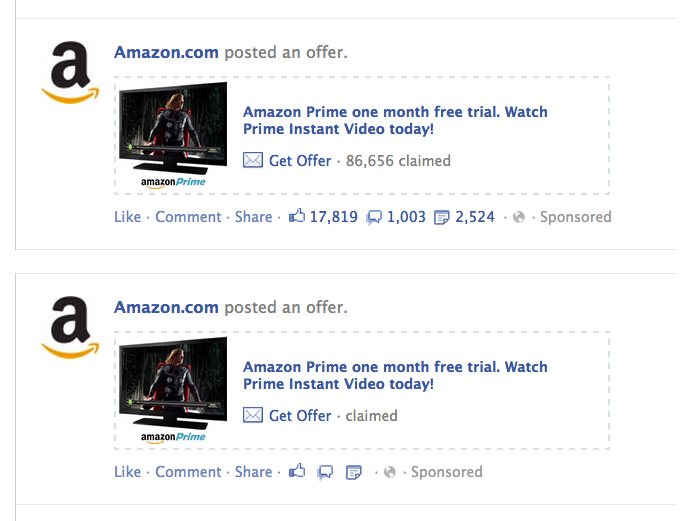 Would we like as many ads if we weren’t first told how many others had liked them before us? Would we write as many status messages if Facebook didn’t reduce its responses (and their authors) to an aggregate value? In other words, the site’s relentless focus on quantity leads us to continually measure the value of our social connections within metric terms, and this metricated viewpoint may have consequences on how we act within the system. My response to this is Facebook Demetricator, a browser extension that enables the site’s users to try the system without the numbers. Demetricator also explores how the designs of software prescribe certain behaviors, and questions the motivations behind those designs. What purpose does this enumeration serve for a system (and a corporation) that depends on its user’s continued free labor to produce the information that fills its databases? Where does it lead when quantity, not quality is foremost? Demetricator is free software that runs within the web browser, constantly watching Facebook when it’s loaded and removing the metrics wherever they occur. This is true not only of those counts that show up on the user’s first visit, but also of anything that gets dynamically inserted into the interface over time. The demetrication is not a brute-force removal of all numbers within the site, but is instead a targeted operation that focuses on only those places where Facebook has chosen to reveal a count from their database. Thus numbers a user writes into their status, their times for an event, etc. are not removed. For example, if the text under someone’s photo says ‘You and 4 other people like this’ Demetricator will change it to ‘You and other people like this’. Under an ad, ‘23,413 people like this’ becomes ‘people like this’. ‘8 mutual friends’ becomes ‘mutual friends’. The user can still click on a link and count up their mutual friends if they care about reducing them to a single count, but under the influence of Demetricator that foregrounded quantification is no longer visible. These removals happen everywhere: on the news feed, the profile, the events page, within pop-ups, etc. Users can toggle the demetrication, turning it on or off when desired. Its default state is on (numbers hidden). 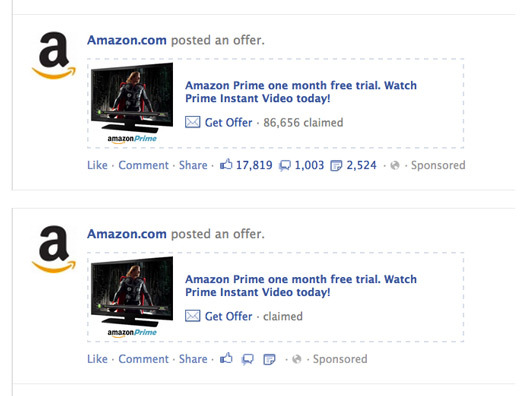 Demetrication of claimed, likes, comments, and shares on an Amazon.com news feed ad. Artist and scholar Matthew Fuller recently interviewed me about Facebook Demetricator. 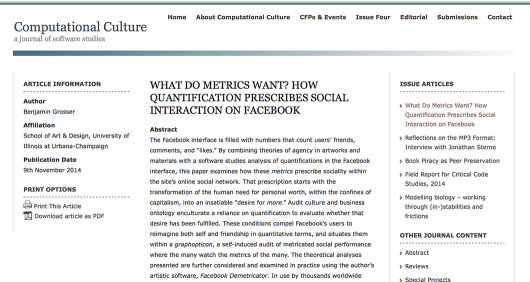 My paper on Facebook metrics, titled “What Do Metrics Want? How Quantification Prescribes Social Interaction on Facebook,” was recently published by the journal Computational Culture. I gave an invited presentation about Facebook Demetricator at the Institute of Network Cultures’ Unlike Us conference in Amsterdam last spring. The title of my talk was “Facebook Demetricator and the Easing of Prescribed Sociality,” and it was part of the Political Economy of Social Networks: Art & Practice panel. How has it changed your experience of Facebook? Is the absence of numbers changing your interactions in any way? Causing you to like less or more, for example? Altering your decision to accept a friend request? Changing how often you comment? Do you find yourself ever toggling it off? Why? Does Demetricator’s removal of the numbers make you more or less aware of their existence? Any other observations you have. Please send me an email with your thoughts. Thanks! I’ve started up a list of frequently asked questions. Please take a look if you’re wondering about privacy, updates, bug reports, and more. Facebook Demetricator was the winner of a Terminal Award for 2012-2013. The Terminal Award, from the Center of Excellence in the Creative Arts, is granted annually to four artists to help in the creation of new internet based artworks. Many thanks to Terminal! The source code for Facebook Demetricator is open source and hosted on Github. As Facebook changes its code constantly, I’m interested in others helping me keep up with those changes and/or to implement performance improvements. If you’re interested, send me an email.